In April I was commissioned to put together a bouquet of flowers for a graduation present. She picked out the flowers she liked and I added leaves and built the bouquet. One of the reasons I love commission work like this is that I would never have picked out these flowers to go together. But they work! And beautifully! The teal lily is balanced out nicely by the blue stamen in the calla lily. And the metallics in the pink flowers all coordinate together without the colors being the same. I kept the leaves simple with some teals and limes. It's really a lovely bouquet. I hope the graduate enjoys them as well. The Spring Bloom show last weekend was a huge success. I had a great time. It was a fun show, indoors with a decent turn out. Artists were doing well and people were having fun shopping. You really can't beat that combination. I did really well too. Here are some shots of my booth. I borrowed walls from my mom. They look so much more professional than my folding wicker wall. The green curtain behind my one wall is actually my neighbor's booth. Though it does look sharp behind the wall. Through out the show we discussed how to make mine and actually my Mom's booth better. More professional. I think the walls are definitely a step in the right direction. But they do seem very blah in front of the white walls in a canopy. The green just makes it all seem cozier. The problem with curtains and a wall is that it gets awfully hot in a canopy with all that in the middle of July. And people don't like to come into a booth when it's hot and stuffy. Not to mention the sweaty monster I'd become hanging out in that booth. I'm not sure where the balance is there. I sold my favorite copper tile piece almost immediately at the show. I really hadn't even had a chance to share it. (Unless you follow me on FB then you've seen it). Sunflower went fast, a partial sunflower on a heat patinated piece of copper. I can't wait to make another one. The layers of petals were so much fun. And I want to do some experimenting with color in the center. I've had a lot of sales lately and not only am I down to 50% of my copper tile stock now. But flowers too. I didn't have a flower in the color combination wanted by a customer so she placed an order. 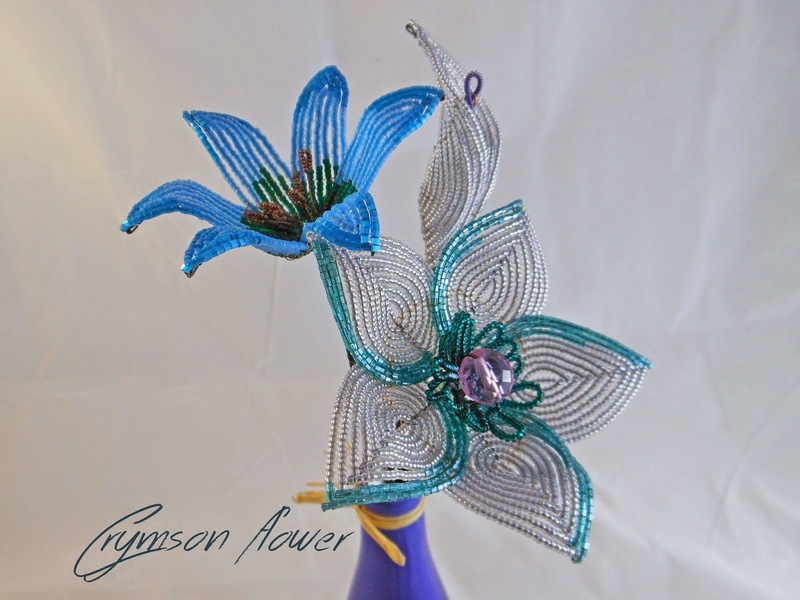 This wonderful teal and blue lily with blingy crystals in the center is on it's way to her house as we speak. I hope she loves it. I sure do. In fact I still have those colors pulled out to make some more. I'm more than a little disappointed to announce that this year's Peoria Botanic Garden show is on different dates. In fact it's not in June at all any more. It's the first weekend in August. Which makes it impossible for me to attend. C and I bought tickets to Lollapalooza that weekend, and they are paid in full. So I will not be going. I also was not accepted into the Chicago area art shows I applied to this year. So despite my big plans for the summer, I may have already done my show of the year. Yes, I'm bummed. But it has also let up a huge pressure on me in an already very busy spring. I still have two applications out I'm waiting to hear back from. We will see how they go. For the first few months of the year I was oozing creativity. Ideas, and colors, and big plans. I made goals to try new art fairs this year. And I enthusiastically started a new line of flowers that I truly feel is my new direction in beading. It is the fork in my beading career's path that I've been waiting to appear for a long time. And then March hit. I was accepted into my first art fair of the year. Spring Bloom in Bloomington Il. In two weeks! I'm excited that it is a new show for me. I'm excited to see how this new group of people work. And to meet a new people. I plan to return to the Botanic Garden show in June that has been so good to me. Unfortunately, I was turned down from the other Chicago area shows I applied to. They were a long shot to get into. I chose some higher end shows and my booth is pretty scrappily put together. I really don't have many of my new tile pieces to show off in a booth, and I think many people find my flowers and wreaths crafty. Which won't go to my benefit in jurying. Oh well. I'm bummed but more looking to what next. I have a whole year! So I'm updating my booth look. I'll show pics in the next post. I'm going to relaunch my website. I'm working on the new redesign, which includes lots of tweaking and decision making. I'm working on all the last minute details for the upcoming show. I'm looking into online and local galleries that might be interested in having a few of my tiles on their walls. This is all a lot of research and it has resulted in a lot less creating than what was going on a few months ago. I've set a date to start beading more new tiles after the show. Basically starting in May I want to have my hands on some wire and beads. 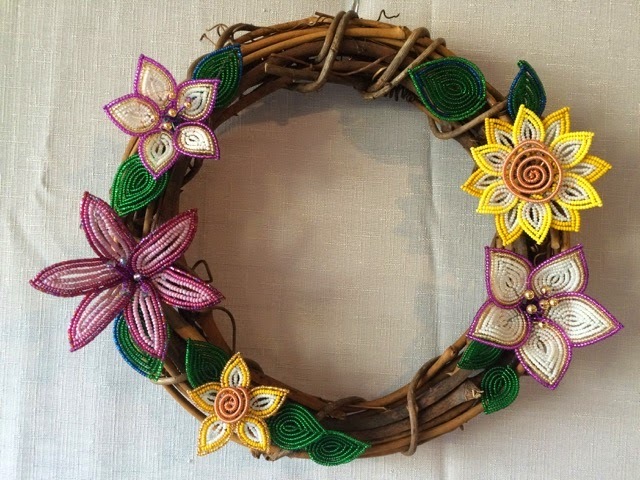 In preparation for the upcoming Spring Bloom art show in Bloomington IL, I have been making some fresh new spring wreaths. I've been super inspired by yellow this spring. 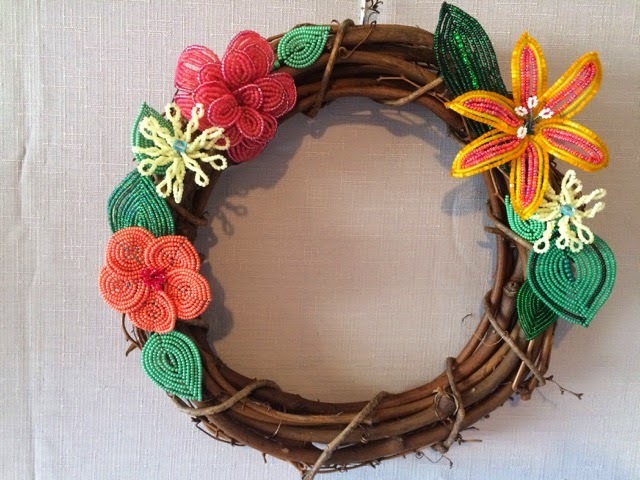 I think the commission wreath I made in January started this obsession. I don't have as big of a palette of yellow beads as I would like. But it has been fun really experimenting with a color that I sort of ignored before. Both wreaths plus one more I have not photographed yet will be available at the Spring Bloom art show April 18. Or if you cannot make the show email me for prices. I hope to see you there.